We started 2019 in a good way. My friends from Litterless PH and Orca Freedivers Philippines organized an Ocean Clean Up in Malaspascua Island, Cebu. It was a great way to start the new year and definitely a good way to make a small (or maybe big) impact to our environment. It is a cause that we all support and we believe in. Everyone was so hyped to participate in this Ocean Cleap Up! We teamed up with the government officials in Malapascua who were very supportive and they provided us a boat for transport and a place to spend the night. We started our day early. Meet up place was in IT Park at 4am, then we started our journey to Daanbantayan in Maya Port where we hopped on a boat going to Malapascua Island. Malapascua Island, is one of the most amazing island in the Philippines. Aside from awesome corals and underwater landscapes, diving with Thresher Sharks is one of the most awesome things to do in the island. A friend of mine was in the Island too! She visited us before our clean up started. We brought our hammocks, tents and sleeping bags, and we just scattered and found our own spot in Daño beach resort grounds the moment we arrived. Some cooked for our lunch and others were chilling and relaxing before we did our main activity. Because we arrived after lunch, we started our clean up late in the afternoon. We all had our mesh bags provided by our main sponsor Jillien from Litterless PH, who gave a good percentage of their sales last year to fund the clean up, and a lot of people donated for this cause as well. I’ve got to say, that picking up garbage underwater is much scarier that on land. Why? Because you wouldn’t know what kind of sea creatures are living or sticking on to some old plastic bags. I promise you this, not all underwater creatures are pretty! Hahaha. My boyfriend and I were a bit terrified when we saw a worm-like-insect sticking on the old sack we took! It was funny and scary at the same time. Anyway, I could say that we all got a good amount of garbage all together, which is totally great! A gentle reminder for everyone. As a freediver or a diver… or an ocean lover…. or even as a human being (you know what I mean), we can always pick up trash anywhere if we want to. NOT just when we are doing clean up activities. Let’s make that a habit. Comprendes? I have to mention this because I had a bad diving experience one time when I saw divers who were not minding the trash floating in front of them (and by the way, they were touching the turtles, which we don’t need to talk about right now because I might get mad……..okay, since I mentioned that…. I’m mad again.). Why I didn’t say anything to them when that happened? 1.) I don’t want to be rude, I was merely tagging along for that specific freediving trip. 2.) Obviously, some of them are not my friends. They might not need my honesty. 3.) It was my first time seeing them not doing anything about it so I gave them the benefit of the doubt. To be honest, I was used to my close freediving friends who always get trashes in every dive we make. But if that situation will happen again with the same people I was with in that diving trip, I would surely call their attention nicely and letting them know what I think and asking them politely what they think would be a better action we should all do. I’m not perfect, and I am not expecting them to be perfect as well. I just simply hope that it would be nice to educate one another, and practice good habits together towards something meaningful that can create better environment for the all things we love. Okay, back to my story…. It was not my first time in Malapascua Island, in fact I visited it when we had a 4-day Island hopping trip around Cebu, Leyte and Biliran almost 5 years ago, but it was surely my first time to stay there overnight, which was totally fun. I think it was because of our Coach who poured too much drink in one shot. I’m pretty sure that everyone thinks that it was definitely because of that. Me on the other hand, was like a mother of a hyperactive two-year old boy. I was a mother who was just looking out and making sure that her son will be okay or even survive the night with a complete set of teeth. You know what I’m saying? All in all, we had a great weekend, even though we woke up like a zombies the next day. I’m hoping to do more of this, this 2019. May we do more of the things we are passionate about this year! 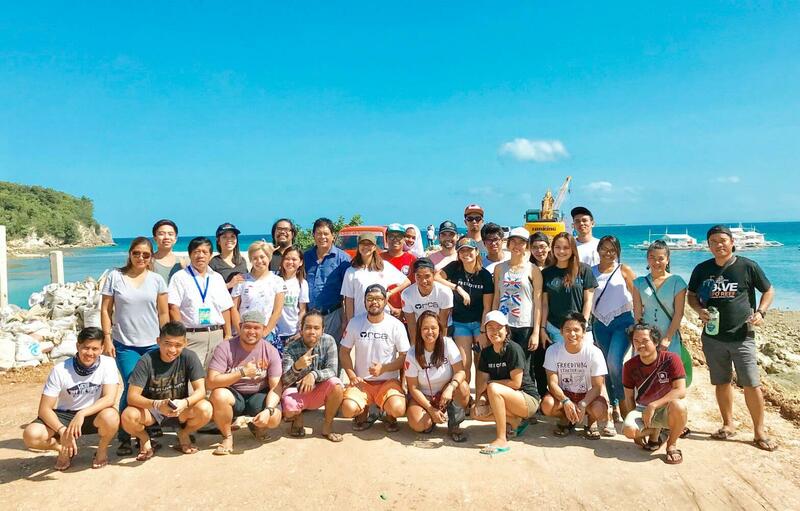 So, in behalf of our Malaspascua Island Ocean Clean up Team, I would like to thank Litterless PH and Orca Freedivers Philippines for organizing this event, and for all the generous people who donated and supported this Ocean Clean Up. We may save our ocean, one dive at a time! Have you tried doing Ocean Clean Up? How was it? Share your tips and experiences on the comment box below.